Mixed Seating At State of the Union - Can It Last? Mixed Seating At State of the Union – Can It Last? 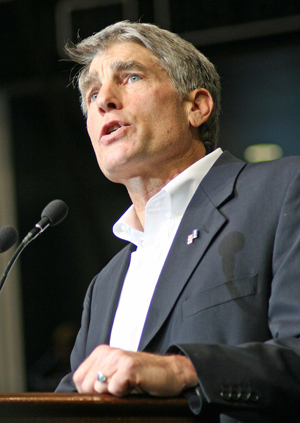 When Colorado Democratic Senator Mark Udall proposed that Congress bridge the gap across the aisle and sit together at President Obama’s State of the Union Address Tuesday night, we couldn’t believe nobody had thought of it before. The proposal is so simple, yet so powerful. In the aftermath of both the midterm elections and the tragic shootings in Tucson, Arizona, our country needs to focus on what we have in common – not what keeps us apart. Our top elected officials are set to arrive in pairs tonight, cross-party date nights, if you will. Matt Schneider points out that Good Morning America had some fun with the high profile pairings this morning, coming up with celebrity monikers and yearbook-esque titles for the top pairings. Tapper humorously designated a few of the more high-profile couplings including The BFF’s (Senators Landrieu and Snowe), The Lincoln Laddies (Senators Durbun and Kirk), The Partisan Pals (Senators Schumer and Coburn), The Southwest Soulmates (Senators McCain and Udall), and in the highly coveted category of Cutest Couple, the award went to Senators Thune and Gillibrand. There are skeptics, of course. CNN’s Pierce Morgan predicted the chummy seating arrangement would only last a day after the Republicans realize that when the Democrats stand and clap for Obama in the GOP’s traditional area, it will appear as if everyone is giving the President a standing ovation. No matter the timetable, we’re proud of our elected representatives for coming together tonight and intermingling the way the American people do every single day. Are you pleased with the state of the seating at the State of the Union?